Debt Restructure? Bankruptcy? Let the sterile technocrats worry about how to protect their own, virtual money. Millions of Greek Zorbas defy the speculators’ misery and catastrophe scenarios. It sounds like a game anyway. That is a great video from the times when people had still something to say. 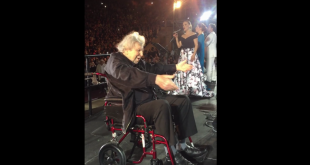 In a rare moment, Mr. Zorba the Greek per se, Anthony Quinn dances at the age of 84 for his friend Mikis Theodorakis. Quinn appeared in the concert stage in Munich, Germany in the year 2000. One year later, Anthony Quinn passed away. I am sure the video will lift up your soul as it did to mine, when a friend sent me the link.